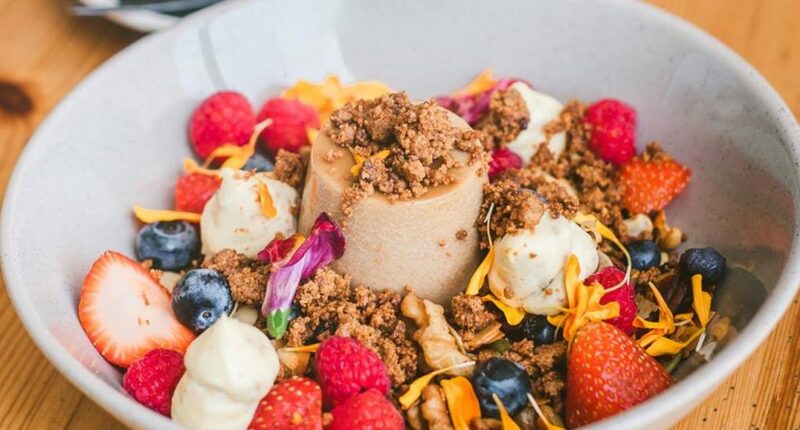 Forget sky diving, climbing Everest and learning another language – our bucket list involves eating our way through every single breakfast Brisbane has to offer. We know it’s a lost cause, with all those seasonal menu changes and delicious new cafes opening every second weekend, but that’s not going to stop us giving it a red hot go. After all, what are Sundays for? So, after sampling more than we’d care to admit, we’ve rounded up our favourite Brisbane breakfast spots you should tick off, one for every Sunday of the year. In no particular order (how could we choose between them? ), here are the best breakfasts in Brisbane! Wake me up before you Mexi-go-go. Let Minnow’s Benedicto is stacked with chipotle hollandaise, spinach, poached eggs, herbed corn salsa, sweet corn and haloumi fritters, and your choice of mixed mushrooms, bacon or smoked salmon. Say thank you mistress for a Japanese style cabbage pancake with bacon, fried egg, Kewpie mayo, house made otafuku sauce, nori, pickled ginger, dried shallots, chilli and bonito flakes. For a brekkie that’d have Kath & Kim saying ‘baby cheezus,’ head over to Hansell and Gretel to grab The Bogan Burger, a fried egg with cheese, bacon, BBQ sauce on buttered Turkish toast with hash browns on the side. Mis u already. Tuck into French toasted brioche with whipped mascarpone and Elixir coffee-choc crème, finished with Elixir coffee-infused maple syrup, smashed meringue, raspberries and chocolate shards. For a good ol’ spag bowl, don’t forget to hit up The Low Road Café’s breakfast spaghetti, which comes with melty parmesan and basil on sourdough toast. Mi amor. Lounge about with Latina Pulled Beef with house smoked cheese sauce, crispy sweet & savoury plantain salted cucumber, cranberry salsa & poached egg. Easy, tiger. Local tiger prawns paired with charred corn and roasted capsicum waffle, créme fraiche and lime salsa will really get your morning off to a swimming start. Brekkie in full bloom looks like this – battered cauliflower florets with rich beetroot puree and natural yoghurt, sprinkled with chilli and served with poached eggs. Boozy. Brunch. Binch. Dubbed S is for Sundays, Patina’s boozy brunch will tend to your bougie side with a four-course menu and free-flowing Chandon S, Chandon Sparkling Brut Rosé, Chandon Blanc de Blanc Bellinis, and Belvedere Bloody Marys. Roll out of bed and straight into a brunch of spanner crab omelette, sweet potato waffle with Korean fried chicken and kimchi, and buttermilk pancakes with brûléed banana, being just a handful of what to expect. Swap summertime sadness with happiness thanks to brekkie orecchiette, mixed with hock, fresh peas, confit lemon and parsley. For a meal that packs a yummy punch, hit up the Pawpaw Café’s potato hash cakes with poached eggs, pumpkin hummus, smashed avocado, dukkah, haloumi & beetroot relish. 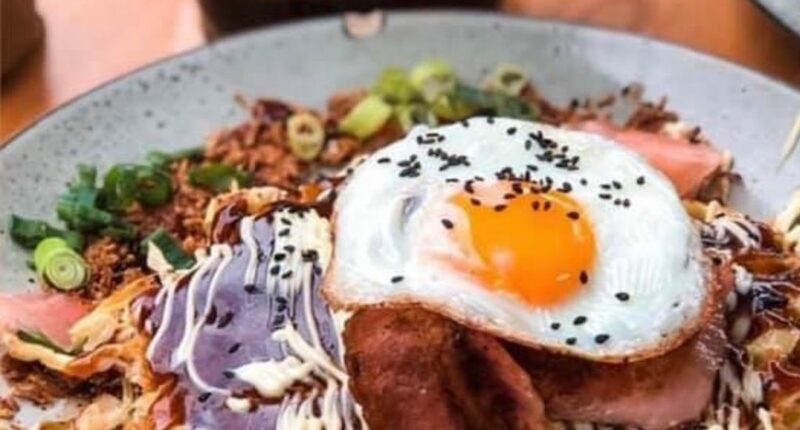 Morning people will love the coconut and chia bircher with seasonal fruit and honey roasted macadamias, while more adventurous diners (and ‘grammers) will be thrilled by the Asian duck salad with toasted rice, peanuts, and Korean chilli sauce topped with a perfectly fried egg. An apple a day keeps the doctor away, but your dentist might need a ring after this sweet boi – toasted waffles served with caramelised baked apple, coconut crunch, dulce de leche and ice cream drizzled with Canadian maple. You’ll go loco for damn good thyme roasted mushrooms on toast, sharing the spotlight with hummus, pesto, feta, kale, dukkah and two poached eggs on rye. Little Loco’s little sister, Miss Jones’ Lloyd’s Breakfast is super delicious and unique (ham and cheddar waffles anyone?). It also comes with bacon, poached eggs, spinach, tomato relish and avo on sourdough. Say howdy to Boston beans with ham hock, a crispy fried egg, crème fraiche and fresh herbs, served with sourdough. It’s a knockout (we would say gnocch out, but we physically can’t anymore) – soft rolled gnocchi is shakshuka style sauce, soft poached egg, crumbled feta and crisp flat bread. Top it all off with a mimosa or espresso martini. Throw a spanner into your usual breakfast routine with this twist on the classic omelette, topped with green papaya, coriander and chilli. As if Bánh Xèo’s translation, ’sizzle cake’, wasn’t enough to make us come running, this brekkie dish is a Vietnamese-style cake with prawns, fresh herbs, and nuóc chấm sauce inside. Crunchy house-made honeycomb butter atop soft, ricotta hotcakes, drizzled with maple syrup. Enough said. It’s the pile of crispy fried haloumi on top of this beetroot and pumpkin bruschetta that won our hearts – but their weekends specials are pretty epic, too! They may have offended all Italians, but the cheesy carbonara with 63-degree eggs, field mushrooms, smoked pancetta and manchego is our idea of breakfast heaven. Find your bliss with a healthy start of mango chia pudding, packed with tropical granola, watermelon ginger jelly and coconut labneh. A little bit exotic, a whole lot filling, this plate comes with prawns, bacon, deep fried egg, oyster sauce, chilli, and shiso cress. Don’t use up all your attention taking in the uber chic Scandinavian vibe around you, or your breakfast buddy might just steal a bite of these dumplings doused in sour cherry sauce with ginger nut crumble. There’s plenty to choose from on the ever-changing Plenty menu, but currently we’re head over heels for the breakfast bowl with pearl barley, charred broccoli, tomatoes, Gusty Ferments sauerkraut, tarator and poached eggs. One of The Gunshop’s classics, these fluffy on the inside and crisp on the outside hash cakes are topped with herbed sour cream, baby spinach and fresh tomatoes. Got a serious sweet tooth when it comes to breakfast? Little Clive will change your life with their fluffy vanilla pancakes with blueberry compote, bacon, and blueberry and thyme maple syrup. We’ll take one without getting caught in the rain. 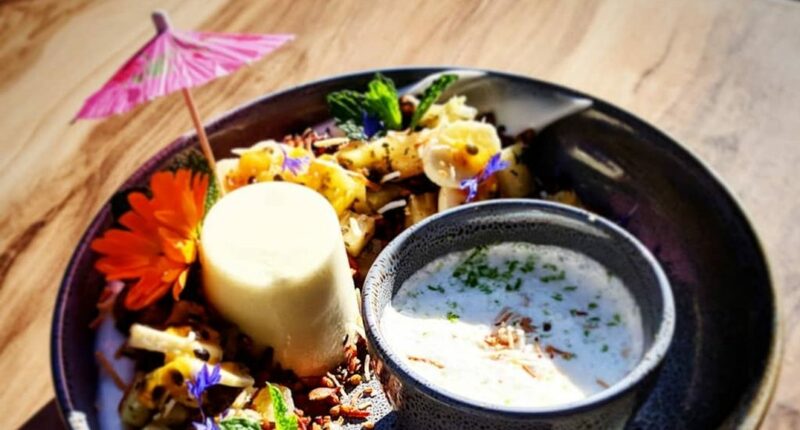 Slide your spoon into smooth panna cotta with coconut cashew granola, minted pineapple, seasonal fruit and a piña colada pour. A traditional Vietnamese street breakfast, this comforting dish is packed with Vietnamese lemongrass pork sausage, mushroom, tomato and tamarind sauce on sourdough. Take a walk on the fluffy side with Deedot’s roasted duck, creamed leek and herb omelette with pea puree, buffalo mozzarella, watercress and roasted hazelnuts. Ay my amigos, the LM Gringos aren’t just any waffles. This combination of chilli cheese cornbread waffle with savoury mince, avocado, chorizo, black beans, fried eggs and sour cream will have your taste buds singing in no time! The fluffiest porridge you’ll ever eat, chock full of cocoa oats and orange segments, and topped with cocoa nibs and muesli. Wham bam, thank you ma’am. 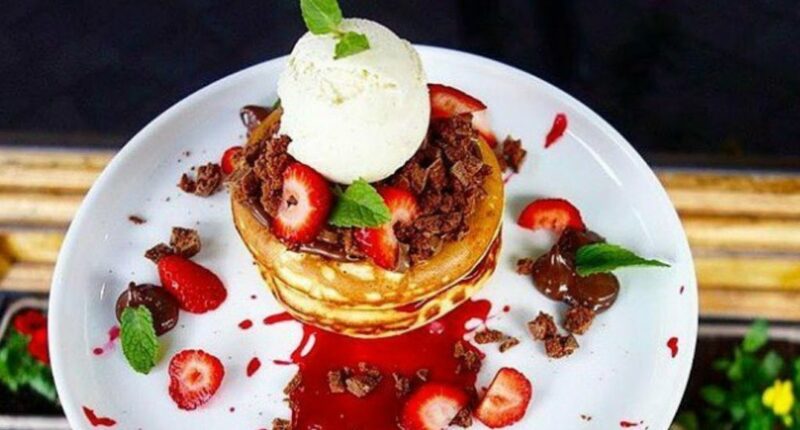 Tim Tam pancakes will change your life as bites of mixed berry coulis, strawberries, Nutella, salted popcorn and vanilla bean ice cream hit your palate. The one, the cannoli – stuffed with whipped vanilla ricotta, burnt orange, macadamia and citrus syrup. Holy moly. Hungry life the wolf? Get the Wolves Big Breakfast with eggs your way, bacon, sausage, mushroom, spinach, chilli jam and sourdough. You’ll like it a Microlot. Shimeji mushrooms, seared cavolo nero and toasted pecans on rye. Forget seasonal menu changes, Dramanti does it on the daily. Expect fresh, local produce in the form of hummus smashed avo, waffles, or who the heck knows! Just go and know that you’ll be impressed. Don’t blame it on the economy, blame it on the avo. Proving that smashed avo doesn’t need to cost much more than your morning coffee, Bellissimo’s staple avo and haloumi on toast is only $8 (and it’s gooood). Come at us. Feast on a generous plate of bacon steak, debrecener sausage, mushrooms, poached free range eggs, garden greens, spiced Moroccan tomato relish and sourdough toast. Spice up your morning with Hungarian beef goulash on turkish with poached eggs, hollandaise, rocket, cherry truss tomatoes and grilled haloumi. 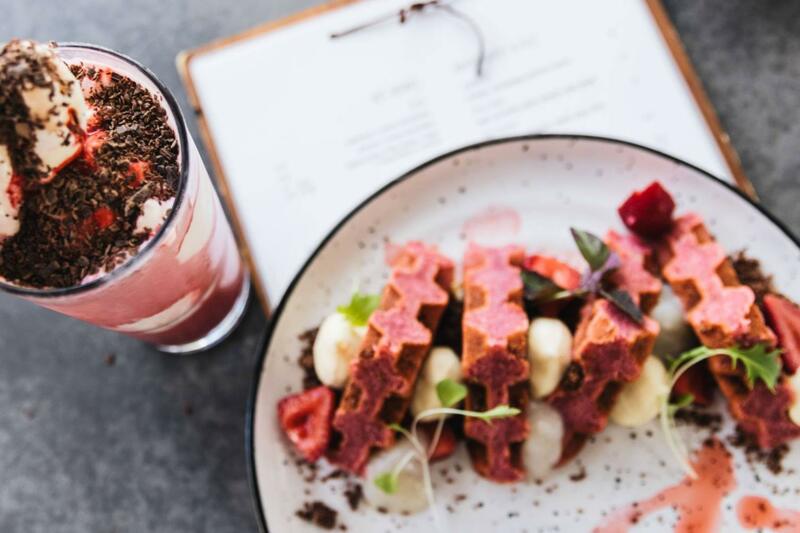 You’ll want to book in a special date for this concoction of strawberry waffles with mascarpone, macerated strawberries, chocolate crumb and lychee gel. Rip into a mocha panna cotta with caramelised white chocolate mascarpone, granola and fresh berries. 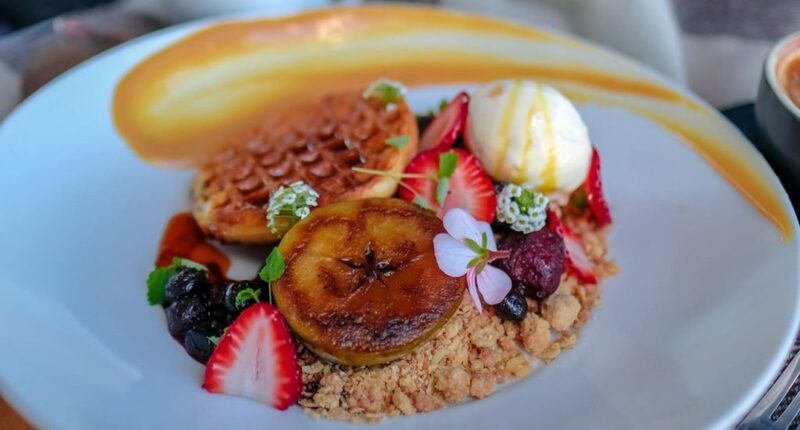 So much more than your average corner store, this Brisbane staple is serving up cherry pie waffles with vanilla and mascarpone ice cream, maple and bacon crumb and fairy floss. Mother clucker. This French toast is tapping into its savoury side with a bit of brioche, maple syrup, bacon and espresso jam, Sriracha aioli and a fried egg complimenting the best cooked chook in the book. Are these enough reasons to ditch your morning Weetbix for the year? We think so. Did we miss your fave Brisbane breakfast spot? Let us know via email at editor@gourmandandgourmet.com.au so we can include them in the next round!